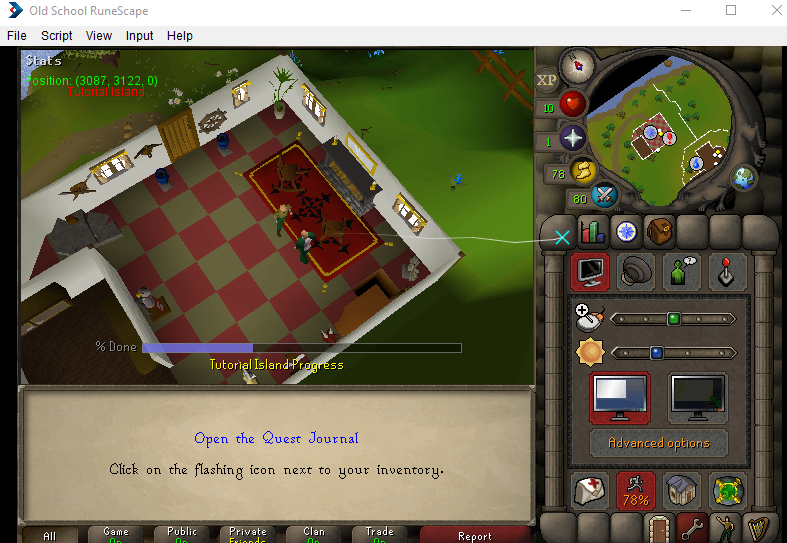 Start the script anywhere on tutorial island. Run time should be about 15 minutes. If script is broken, please post the part of the tutorial where the script broke or the issue with the script. Use at your own risk as tutorial island has a very high ban rate. Nice been wondering when someone would make a new one, out of curiosity do you use a component query or just static widgets? I only ask cause that’s where the others mostly fail is just wrong/outdated widgets. Now that I think about it, I should have used component queries. I wrote this script 6 months ago and had to fix the widgets just now before uploading but it didn't take very long. Was just curious was all good luck with it all! how do i add scripts from the forums like this one? jagex updated tutorial island yet again. Script should be fixed now. I just pushed a new version. Try it now. I know. That was the change I just made to the script. This script has a tendency to get stuck at the polling station and the npc that talks about the bonds. Sometimes it will continue but it takes around 3-5 minutes to figure out what it needs to do. Edit: Sometimes when it needs to cook the shrimp, it will make the fire by a tree and it will accidentally click the tree after selecting the shrimp, instead of selecting the fire. Resulting in "Nothing interesting happens." When the fire runs out the bot won't create a new fire in its place, causing you to have to pause the script and intervene to pass this point. Had one or two hiccups but it completed the entire tutorial island for me within 12 minutes. huge thanks!